Europe has a rainbow of train classifications, from slow local runs to high-speed EC and Eurostar trains. Here's a primer on how to use the trains in Europe. A close-up of the "departures" poster in the Trieste train station. The left column shows departure times, the next one the type of line (R for regional, iR for inter-regional, IC for InterCity, EN for EuroNight, and ES for EuroStar) and the train number and (in the case of some of the high-speed lines) its name. 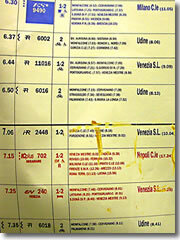 The third column tells you which trains are composed of both first- and second-class cars and which (those local runs to Udine) of just second-class as well as whether you can bring bikes or wheelchairs on board, if sleeper cars are available (as is the case with the 7:25 to Venice), and—most importantly—an 'R" to indicate on which trains a reservation is required (here, on the 6:20 to Milano, and the 7:15 to Napoli/Naples). The biggest column runs down the list of all intermediate stations where the train will stop followed by, in large type, the final destination and arrival time. (In order to make it legible on the screen, I cut off the two right-most columns, which showed some esoteric details on each train, and, on the far right in a big bold font, the number of the track from which it will leave.) So, this schedule shows that you could catch one of three different trains to Venice. The "regional" that leaves at 6:44 gets you into Venice at 9:09, for a total trip time of 2:25. The 7:06 "inter-regional" takes nearly three hours to get there—but it'd be far quicker to wait until 7:25 and hop the speedy EuroNight, which actually gets to Venice first, arriving at 9:25 for a trip time of just 2 hours. These range from local runs that stop at every tiny station to high-speed bullet trains such as France's TGV, which set the world's speed record for a national rail run (320 miles per hour, though it usually cruises at 130 miles per hour). 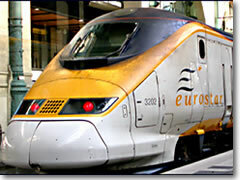 These trains include specialized and expensive high-speed trains within nations (France's TGV, Italy's ETR/Pendolino, Spain's AVE, Germany's ICE), as well as international high-speed runs with fancicul names (Thalys from Paris to Brussels; Artesia from Paris to Torino and Milan in Italy), and the Eurostar, which started life just as the company behind the Chunnel trains that zipped back and froth through the the Channel Tunnel, but now runs many of the major long-haul trains across Western Europe (much more on this below). Beyond these, the fastest trains you'll usually take are EC (Eurocity) or IC (Intercity). The only difference between the two is that the Eurocity train crosses an international border (overnight versions are sometimes called EN, or EuroNight). Many high-speed trains throughout Europe require that you pay a high-speed supplement of around $5 to $15 in addition to the regular ticket price. If you're buying point-to-point tickets, this supplement is included in the full price. With a railpass such as Eurail, you may have to purchase this supplement separately. The train conductor will sell you one, but he also will assess you a small penalty fee. I always check at the ticket office to be sure and pay for it in advance. In addition to supplements, reservations are required on some of the speediest of the high-speed runs, including Eurostar (the Channel Tunnel train), TGV in France, ETR/Pendolino in Italy, and long-distance trains in Spain. Any train marked with an "R" on a schedule needs to be reserved ahead of time for a fee ranging from $10 up beyond $50 (the latter when a meal is included). Aside from a few public fountains, trains are really the only places in Europe where the old "don't drink the water" rule applies. Take it from me, though: you will get thirsty, so plan ahead and bring a bottle of water on board with you (or, on most trains, there is a bar car). 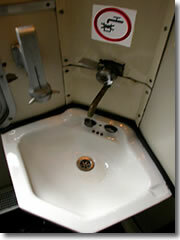 One final note before we get into the Eurostar: Don't drink the water on trains, not even to rinse your mouth. It's greywater meant for handwashing only. This is a bit frustrating, since trains—especially overnight trains—dehydrate you quickly. So make sure you bring bottled water to sip throughout the ride and also to rinse out your mouth (and your toothbrush) after an overnight train ride. The Eurostar train connects London with Paris (and London with Brussels) through the Channel Tunnel. trains from London to Brussels take 1:51 to 2:04; trains from London to Paris take 2:15 to 2:26—however, due to the time change (England is one hour behind Belgium and France), the clock has you arriving in Paris 3:15 hours later (in Brussels 2:15 hours later) when leaving from London. On the plus side, going from London to Paris you arrive 1:15 hours later by the clock, from London to Brussels you're there in just about an hour! Since the classic ferry route—regular train from London to Dover, ferry over to Calais, regular train from there to Paris—takes essentially all day and costs almost the same amount, Eurostar is a great deal. The high-speed trip on the Eurostar through the Channel Tunnel is a 45-minute non-event in darkness—but, hey, you sure do get to Paris in no time. Still, I kinda miss watching the white cliffs of Dover recede into the distance whilst chugging across the English Channel aboard a slow ferry (though I don't miss the ten hours it took to get to Paris that way). One of the truly sad things is that Eurostar pricing works a bit like that of traditional airlines: tickets cost a bit more than you'd really like them to, and for some inexplicable and asinine reason, one-way tickets often cost more than round-trip ones. Seriously. I just plugged a random set of dates into the booking engine, and it wanted to charge me $150 for a round-trip ticket, but $195 if I bought just the outgoing one by itself. That's just stupid. I'm not going to provide specific prices here because (a) they are seasonal (and I don't know when you're traveling), and (b) there are more than a dozen price categories with weird names like "Lesiure 3," "Premium," "Flexi Standard," "Lesure Flexi 1," "Business Value First," and "Leisure Day Trip." Unfortunately, there isn't a category called "Cheap." London's glorious Victorian redbrick castle of St. Pancras is right next-door to King's Cross Station, home to the famous platform 9-3/4 where Harry Potter used to catch the Hogwarts Express—a perfect sightseeing excursion when you have half an hour to kill before your train (tracks 9 and 10 are actually in a seperate shed from the main station, and sadly there's no real barrier between them, but the station has thoughfully labelled the wall at the back of the shed "Platform 9 3/4" and embedded a luggage cart in the wall). Have a full hour to spare? On other side of St. Pancras is the woefully under-visited British Library. About the best advice I can give is that the fares with the word "leisure" in the title tend to be cheapest, and that discounts are available for seniors (over 60), youths (under 26), children (aged 4-11), and railpass holders. In London, Eurostar trains arrive and depart from St. Pancras Station (www.stpancras.com; see sidebar) Note that, until November, 2007, the train station used in London for the Eurostar was Waterloo Station, so there's a good chance your guidebook might be a bit out of date on this issue. In Paris the train station for the Chunnel train is Gare du Nord in Paris (www.gares-en-mouvement.com); in Brussels it's the Central Station. This article was last updated in January 2008 . All information was accurate at the time.